Persona 4 takes place in a rural town called "Inaba." 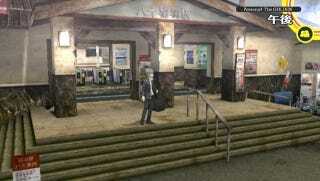 And the town's train station, Yasoinaba Station, is where the game's protagonist arrives on the scene. The station is based on an actual place, and soon it will be gone forever. The real station is Isawa Onsen Station (石和温泉駅) and is located in Yamanashi Prefecture. Below, you can see how the station compares with its in game counterpart. Yes, there are some slight differences, but Yasoinaba is clearly inspired by Isawa Onsen Station. Yesterday, Japanese Twitter user @StaffOfficer490 tweeted out a photo of a notice stating that Isawa Onsen Station will be rebuilt. The twitter user added, "Bad News: Persona 4's station is disappearing." The notice has since been retweeted over eight thousand times.